Indus Motor Company ltd. (aka Toyota Pakistan) The manufacturer and importers of Japanese Toyota cars in Pakistan, now introduced Toyota PRIUS in Pakistan. 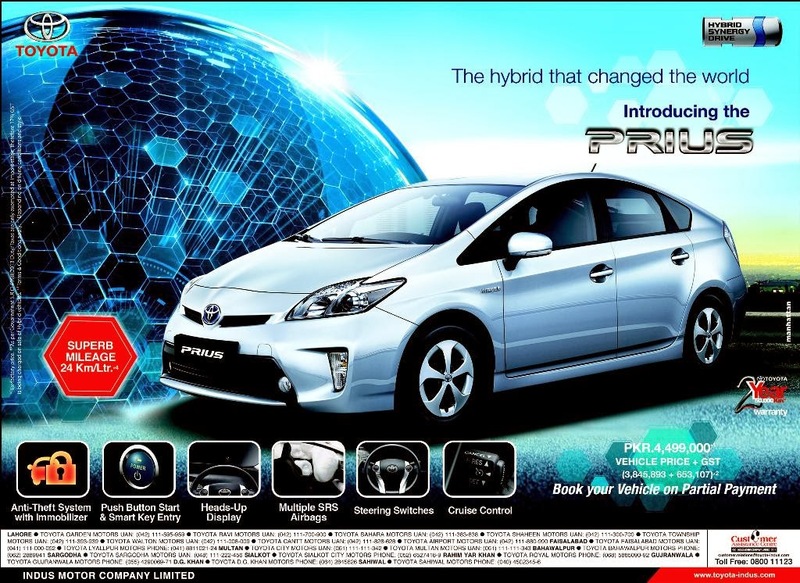 Toyota Prius is first Hybrid car which is officially launched by Toyota Pakistan. The company is claiming that fuel consumption of Toyota Prius is 24 Km per Liter. Toyota Pakistan is offering 2-Years warranty with the purchase of brand new Toyota Prius. JBL audio CD player with Bluetooth support. The 8 speaker sound system provides clear and enhanced sound to every sear. The system’s touch panel and steering switches enable easy operation. A steering switch with guide display that reduce eye movement to the hand area with touch sensor switches for the audio control, air conditioner control, Eco Drive Support Monitor and Trip Meter control switches. Cruise control automatically controls the speed of the car. The driver sets the speed and system takes over the throttle of the car to maintain the speed. The system thereby improves drive comfort in steady traffic conditions. A USB port and an auxiliary audio jack allow portable music play connectivity. The touch panel of the audio system acts as the interface for the connected player and also displays songs information.